The 16-bit-styled action-RPG Hyper Light Drifter is a poster child for Kickstarter success. It went live in September 2013 with a $27,000 goal, and finished in October 2013 having raised $645,000. That's a lot of stretch goals covered, and therefore a ton of extra work, but developer Heart Machine is zeroing in on actually getting the game out. According to a new Kickstarter update the game now has a "release window" of spring 2016. And there's a new trailer too, in case mere words are not sufficient to sate you. "Release dates are a sensitive subject, and our attitude has been to take the time we need to do this right. Though we have hinted at estimated dates before, we are thrilled to finally come to you in certainty with our official release window!" the update states. "The first release will come to Windows and Mac, followed as quickly as possible by consoles. A very significant labor of optimization and platform requirements go into bringing a game to consoles. We have already begun juggling that process in tandem with the completion of the core game, but have decided to not withhold the PC version while we wait for the console versions to pass certification." The development process has taken this long simply because Hyper Light Drifter is a big game being made by a small team. It was expected to be out this year, but the studio has decided not to rush the process. "We've been working full-blast for almost two years, and the team as a whole needs to continue to steadily pace ourselves, instead of crunching," the update says. "Pushing any harder would burn us out, leading to a negative outcome." 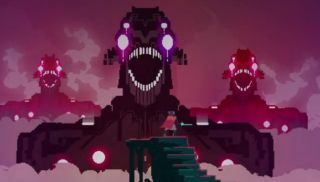 Tim got some hands-on time with Hyper Light Drifter in March, as did Andy in October 2014, and they both seemed rather impressed with what they saw. More information about Hyper Light Drifter, and a link to preorder, are up now over at heart-machine.com.